The site was created in 2008 upon the request of some Forces Reunited members who were looking for information on their ancestors but had come up against dead ends with the usual genealogy sites. Since inception we have gone on to add over 21 Million individuals records and are currently adding over 250,000 records a month. 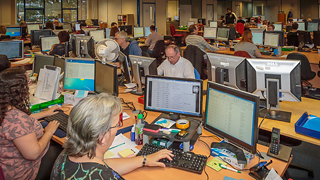 All of our employees work in our UK offices, including the data entry operators who add new records to the site. We could have followed some of the more well known sites and out-sourced this to China, but we wanted to ensure our data was as accurate as possible, and we also felt we had an obligation to employ UK staff and pay our fair share of UK taxes! Our Collections List is vast and we have a lot of exclusive collections other sites don't hold. If there's a record you're after that you simply can't get anywhere else but we don't yet hold it - watch this space! On the records pages you will see all our records are transcribed digital data, i.e. we don't currently hold original images such as pension records etc. but of course, what it does mean is that we can add data no other site (which only adds physical image data) will. Our collections list is testament to that. Our ethos has always been not only to supply records of data, but also to add a huge amount of supplementary data to each record. When you view a record, you will see not only the record information, but also information on the regiment, unit, base or ship your ancestor served in/on, the battles they may have fought in, information on medals they may have been awarded, photos of their time etc. all painting a picture of what life was really like for you ancestor that a name record simply can't achieve. Finally, we also have a Historic Documents Library that already holds over two thousand publications some more than a hundred years old that is automatically cross referenced each time you search for an ancestor or other piece of information on our site, and if anything matches we will show you an article from a publication that also gives you information on your ancestors life. Subscribing to Forces War Records costs just £8.95 for four weeks access. This gives you full unlimited access to everything we hold. We feel this is far fairer than most sites credit systems where you quickly run out of credits or they expire before you have a chance to use them. We do hope you find the site a useful resource and mention the site to others. If you do need any further help our online support staff are waiting to help you, and you can also ask questions in our open forums where other members and our own specialist genealogy researchers will also try to assist you with your quest. With thanks to David J Barnes, The National Archives, Commonwealth War Graves Commission, West Glamorgan Archives, Kevin Asplin, Jack Marshall, Justmedals, the Japanese POW Research Network, Mansell.com, TaiwanPow.org and many, many others for their help.